OK, so I go to the post-office, to my little PO Box and I find one of those nice flat envelopes with the bubble wrap inside. Nothing unusual so far. When I pull out the disc I see post-apocalyptic cover art that could have come from the pen of Matt Groening (that is a compliment). And looking at the inside I recognize none of the musicians and none of the composers (also not unusual). Bassoon and Saxophone? Sounds iffy at best. And these folks hail from Idaho. Idaho? The last time I heard the name of this state in relation to classical music La Monte Young was being discussed (he was born in Idaho). They now hail from Portland. But when I put this disc in my CD player while on one of my longish drives (we drive a lot in California) I was delighted and mesmerized. These two musicians, both professors at Idaho university, seem to have cast their net into minimalist waters. The variety within that definition of a musical style demonstrates the apparently boundless creative ways of working within that style and the limitations of the term in helping listeners know what to expect. Well, expect virtuosity, expect clever invention, and expect to be entertained. Despite the pop art cover (the entire production will be my exhibit A when I propose a law requiring a minimum 12 x 12 packaging for all music and video releases) the music consists of some really solid compositions which send quite a challenge to the artists while leaving the listener enthralled (no easy task). The only mistake is putting the liner notes one line. Die hards like yours truly will seek out and read these (actually very useful notes) but I think most listeners will not make the effort. Ah, well. Usually these solo instruments are accompanied by a piano or a guitar when they are not a part of a larger ensemble. When these two instruments play together one might choose a strategy of having one instrument accompany the other. The compositions here utilized a variety of strategies, many of which place some serious physical demands on the musicians. What all these compositions manage to do is to sound as though they were intended to come out exactly as you hear them in this recording (also a daunting and frequently unaccomplished task). These machinations stem from the efforts of the Post-Haste Reed Duo consisting of Sean Fredenburg on saxophone and Javier Rodriguez on bassoon. These works are commissions written for them (who else?) and presented here in their world premiere recordings. The composers (Ruby Fulton, Drew Baker, Michael Johanson, Edward J Hines, Andrea Reinkemeyer, and Takuma Itoh) presented me with yet another research task (also not uncommon with the unusual music that comes my way), that of finding out who these people are and, frankly, if I should file these names away in my future successes file, keep them on the radar in the hopes that they will continue to produce work of this quality. I’d say odds are good. It is this writer’s opinion that the category “electro-acoustic” carries such a wide range of connotations that it is of limited use to a listener. This album is so characterized and here simply means that both electronics and acoustic instruments are used. Even the concept of electronic music is difficult since such a designation. Playlists on Spotify and iTunes usually points the listener to a form of pop/dance music if you search for electronic. Further complicating things (and I think this is at least in part the point here) the electronics here include fixed media (electronics which does what it is programmed to do and does not interact with the performers or simply plays alone) and robotic electronics as well as electronics which interacts with the performer. You will have to check the composer’s web page for more information on what exactly the “robotic” media are. This is cutting edge in the sense that it is experimenting with new media in combination with more traditional media (and simple electronics is now “traditional media” having been superseded by the new fangled). The actual sound of this music seems to inhabit a rather spare sound world akin perhaps to that of late Morton Feldman but with more brevity. These pieces last from 1.5-10 minutes on average and demand some concentration on the part of the listener. Think maybe a cross between Feldman, Webern and say Subotnick. Now one could conceivably play this music at a low volume in the manner of so-called “ambient” music. There are not many dynamic changes here to take you away from that sort of reverie. But that does not really seem to be the composer’s intention. These are concentrated little essays, each seeming to explore the parameters of its context, fixed media, live instruments, robotic media, and combinations of these. Steven Kemper is a new name to this writer. His education and wide interests are available on his web site. While he has an impressive bibliography with cutting edge research interests in music and sound this appears to be his first CD. There are 15 tracks which comprise 5 works. Mythical Spaces (2010) is for percussion with fixed media in 5 separate movements. Breath (2015) is for fixed media alone in one movement. Lament (2015) is also in one movement and is scored for flute with interactive media. The longest single movement comprises In Illo Tempore (2012 rev 2017) is scored for saxophone, bassoon, AMI (automated monochord instrument), and CARI (cylindrical aerophone robotic instrument). It clocks in at 7:48. Last but not least is The Seven Stars (2012) for amplified prepared piano in 7 movements. Live performers include Mark Truesdell, percussion; Wayla Chambo, flute; David Wegenlaupt, saxophone, Dana Jessen, bassoon, and Aurie Hsu, prepared piano. This is music which requires some serious concentration from the listener. Hearing/seeing this live might provide some additional aspects due to these strange electronic/robotic instruments but the point here seems to be one of an inner voyage which, if you focus you listening energy, transports you into this composer’s imaginary spaces. Whether you will enjoy this or not is difficult to say but it is certainly worth the effort. The French Horn and the Bassoon are two instruments seldom associated with jazz and improvisation. 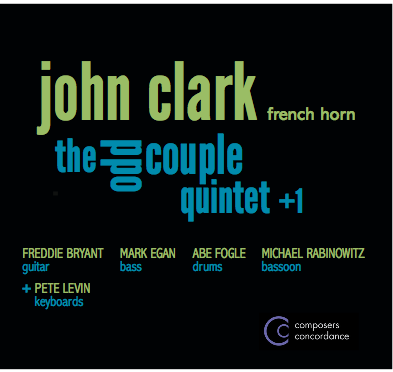 Enter John Clark and Michael Rabinowitz who, along with their fellow musicians put together this playful and entertaining album. Clark, born in 1966, studied at the University of Rochester, Eastman School of Music and the New England Conservatory. He studied under George Russell and Ran Blake. Currently he is on faculty at the Manhattan School of Music. Beginning playfully and appropriately with their arrangement of Neal Hefti’s theme from the movie The Odd Couple. From there the group traverses through various classical music pieces always with their unique jazz inflections. This disc contains 8 tracks and is consistently pleasant, inventive and entertaining. Clark, whose discography lists 18 albums on Wikipedia, has worked as a session musician and has recorded with people like B.B. King, Leroy Jenkins, Linda Ronstadt, Ornette Coleman and many others. Building on work by folks like Jacques Loussier, Clark’s group basically traverses classical pieces with a jazz tinge. 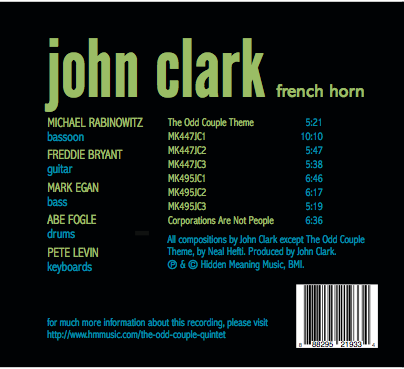 All compositions, with the exception of the Odd Couple Theme are listed as being by John Clark but alert listeners (or those who read the lucid liner notes) will identify the original sources on which these compositions are based. In addition to the two named principals they are supported by Freddie Bryant on guitar, Mark Egan on bass, Able Fogle on drums and Pete Levin on keyboards. The last track is perhaps the most complex of the set and ties the album together with a fitting conclusion. All in all this album is a lot of fun for fans of both classical and jazz.